Surveys show that the margarita is the most popular drink ordered in bars and restaurants around the world. The authentic margarita is mixed from Tequila, sour mix and triple sec (sweetened lime juice and Cointreau or Grand Marnier may also be used). Today, about 60 percent of the margaritas consumed are ordered on the rocks and 40 percent are frozen. Shake all ingredients with ice in a shaker. Strain over fresh ice into a Margarita glass or Old-Fashioned glass. Taste for Balance. No garnish, no salt. Moisten the rim of a large margarita glass with a piece of lime, and dip the rim into a small plate of margarita salt. Mix together ingredients in a shaker over ice, strain into the glass, and garnish with lime. Note: Controy is a Mexican brand name of Orange Liqueur, similar to Cointreau, the French Orange Liqueur. French Cointreau or Triple Sec may be substituted for Mexican Controy. 1 ounce freshly squeezed lime juice Salt a cold champagne glass by wiping a cut lime around the rim and dipping into coarse salt to the depth of 1/8th inch. Put the ingredients into a shaker with an abundance of cold, fresh ice. Cap the shaker and shake the Margarita well. Strain into the prepared glass. Pour salt onto a small plate. Moisten the rim of a large margarita glass with a piece of lime, and dip the rim into the salt. 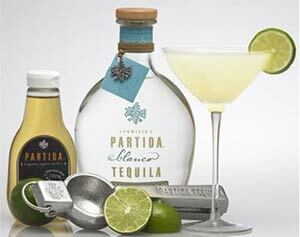 Mix together ingredients in a shaker over ice, strain into the glass, and garnish with lime. Moisten the rim of a large margarita glass with a piece of lime, and dip the rim into into a small plate of margarita salt. Mix ingredients together, freeze for several hours to get a slushy texture, serve with 2 ice cubes and garnish with a lime slice. Instead of taking the time freeze the mixture, mix the ingredients in a shaker over crushed ice and strain into the salt rimmed glass. This recipe tends to be a little strong.